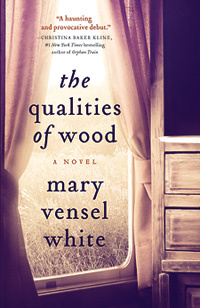 Mary Vensel White’s debut novel The Qualities of Wood was provided to me by TLC Book Tours. It looks like I’m first up on the blog tour and I sure wish I had better news for you, folks. The Qualities of Wood is Vivian Gardiner’s story. She has given up her life in the city to join her husband, Nowell, in a small town where they will live in the house he inherited from his grandmother. The plan is that they’ll do some cosmetic work to the property and in a year or so, sell it. Nowell will also use the time to work on his second mystery novel. On the day Vivian arrives at the Gardiner homestead the body of a teenage girl is found in the woods at the back of their property. Although her death is almost immediately ruled accidental, it still seems to be the sun around which all the players in this novel orbit. All that sounds promising, right? They turned at the back corner of the house and the open space hit her like a deep breath. So my issues with the book don’t have anything to do with the quality of the writing. My issues have to do with pacing and characterization. And I am a reader who can generally read books that don’t have much of a forward thrust. Okay – so Vivian arrives at this run-down house. She and Nowell, who have only been married for about four years, have been separated for four weeks. It’s going to take some adjusting. Soon enough they seem to fall into this pattern. Nowell gets up early and gets to work in a little space he has partitioned off from the rest of the kitchen with a sheet. Vivian alternately lazes about or works at sorting through the lifetime of junk Grandma Gardiner left behind. The reader is treated to a laundry list of this detritus: “used paperback romances, sewing things and scraps of fabric, and entire box of plastic silverware, plates and cups.” There’s dressers full of clothes and other personal items. There’s even a gun, which seems promising – but sadly isn’t used to kill anyone. And I think that’s my main complaint about The Qualities of Wood. There’s no mystery here. Vivian is stuck in a small, unfamiliar town with a husband who becomes increasingly strange to her. But she’s strange, too. I never really warmed up to either of them – or any of the characters for that matter. When Nowell’s brother, Lonnie, and his new bride, Dot, show up it just ups the ante of strange behaviour. The narrative alternates between Vivian doing mundane things like subscribing to the local newspaper, visiting with her new friend Katherine and running a three-day yard sale (and did we really need to hear about all three days?) and breaking into her neighbour’s house in the middle of the night. Okay, sure Mr. Stokes is odd, but Vivian this is not the behaviour of a rational person; you know that, right? There’s also some back story – like the time Vivian got lost in the woods (I thought that was going somewhere) and the time she snuck out of her house to go to a party (so is this, then, meant to be a novel about someone who barely had a chance to rebel and now she’s married and her husband is pressuring her to have kids and she just wants to be free?) In some ways I think part of my dissatisfaction with this novel is that there’s too much going on. Some of it feels like filler (like describing Katherine’s driving skills) and some of it feels like unrealized potential (glimpses into Nowell’s latest novel). Either way, I was ready to pack it in at page 100. If The Qualities of Wood is meant to be about secrets, as the blurb on the back of the novel claims it is, they better be worth spilling. When all is revealed in the novel’s final pages, none of what is exposed makes up for the minutiae the reader has plodded through to get there.